Bidding on what is now generally considered the greatest photo Andy Warhol ever took ended Wednesday morning. Christie’s started the bidding at $2,000, but anticipated that it could go as high as $5,000. It went for $5,500—$5,500 determined Auburn dollars. Thanks to you. UPDATE: Thanks for sharing and reaching out to us about this photograph. JCSM’s bid was accepted, and the museum has acquired the photo for the permanent collection. More to come soon. Art Changes Lives, and War Eagle. After seeing The War Eagle Reader’s story on what we’ve dubbed Toomer’s Oates, the museum’s curating crew, Warhol fans from way back, sprang into action. Hendrix credits TWER—yes, for this we will totally, totally toot our own horn—not only with making the museum aware of Toomer’s Oates, but instilling the sense of urgency in Auburn art lovers that has now lead to what is arguably the museum’s greatest acquisition (Chihuly who?). 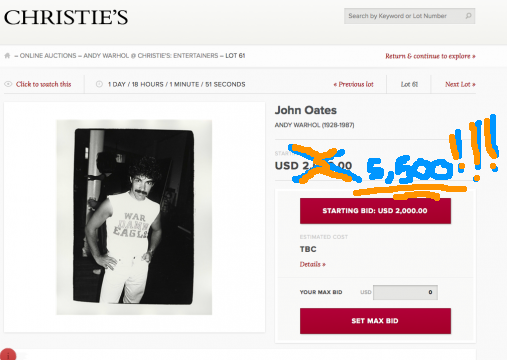 So how soon will John Oates and his Auburn shirt return in spirit to their adopted hometown? “The item is shipped out after payment is received and can take a few days to arrive,” a Christie’s spokesman told us. You can help art change even more lives here. Like us on Facebook. Follow us on Twitter. Talk about things in the Forums. Want to advertise? Spare a dollar? Art may change lives, but Auburn changes art. Awesome! Will definitely go by the museum and check this out! War Eagle! !